When the “Father of the H-Bomb” Dr. Edward Teller addressed an International Seminar on Planetary Emergencies in August 1979, flagship insurer Lloyds of London was taking on water after losing almost $11 billion in just four years and the first “Category 6” hurricane ever recorded was packing sustained winds of 200 mph. With the planet heating up more than 2 degrees Fahrenheit per century, bellwether Antarctica was warming 10-times faster than this global rate. Adele and Chinstrap penguin colonies were going extinct on the Antarctica Peninsula, where stunned scientists clad in windbreakers strolled in unprecedented rain showers marvelling at a first-time profusion of wildflowers. Frightening forecasts called for even more rapid heating over the coming decades. Computer simulations by climate modeller Ken Caldeira at the Lawrence Livermore atom bomb laboratory predicted that 10 million tons of tiny airborne particles could reflect 1% of incoming sunlight – resulting in no further warming despite an anticipated doubling of C02 emissions over the next 30 years. Chemtrail spraying began in earnest in 1998, when USAF “Weather Force Specialists” began gridding North American skies with lingering white plumes spread by formations of huge aerial tankers. Twelve years of nonstop chemtrails later, it’s clear that these desperate greenhouse-mitigation measures are not working. The first decade of the 21st century was the warmest ever recorded. 2010 saw the hottest summer ever known in Russia. Unrelenting heat sparked hundreds of wildfires that killed 15,000 people from smoke inhalation, while spreading radioactive dust from Chernobyl and even older nuclear disasters across wide regions. Three days later I was trudging in deep snow as freaky 60-mile-an-hour blizzards and frigid temperatures clobbered the Pacific Northwest. Though it was not yet officially winter, record foot-in-a-day snows turned the Northern Plains and Rockies into instant igloo factories. Only a few months previously, much of North America had par-broiled in record-shattering heat. West Texas experienced a 111-day rainless stretch – the longest ever recorded – followed by two rainfalls so heavy such an event had occurred only once per century. “These events really are part of bigger trends. You can go back nearly 2,000 years and the conclusion still holds – the current warmth is anomalous,” stressed Michael Mann, director of the Earth System Science Center at Penn State University. The burst of warming over the past two decades “takes us out of the envelope of natural variability” – including solar flares and Earth’s slowly changing tilt, which account for a fraction of the worldwide warming. Even in a warming world, regions with traditionally cold winters are seeing cold air masses colliding with a warmer atmosphere that’s able to carry more water vapour. The resulting precipitation is suddenly dumped as snow. “Heavy snowfall and snowstorm frequency have increased in many northern parts of the United States,” notes a June 2009 report published by the U.S. Global Change Research Program. In my lifetime, record high and record low temperatures occurred at approximately the same rate in the United States. But after a one-degree Celsius global temperature rise over the past sooty century, record highs are now occurring at least twice as often as record lows. As droughts, wet years and torrential rainstorms become the new norm in the American southwest, these big swings in precipitation are tied to the rapid rise and variability in Atlantic Ocean surface temperatures – directly attributed to greenhouse emissions. Warmer areas of the USA are seeing fewer big snowstorms, but the upper Midwest and the Northeast are getting hit with more of them as cold air usually bottled up in the Arctic is blown south. “As we lose more sea ice, we’ll probably see more of that,” says Jim Overland, a NOAA oceanographer. Here in British Columbia in late November 2010, as Russians and Englanders froze I sat comfortably on my back deck reading a magazine in t-shirt, jeans and bare feet. As Greenland recorded its warmest year on record, 2010 was another low year for sea ice cover. (The three lowest years have taken place over the last four years.) Despite intense chemtrail activity, the largest glacier loss ever observed in Greenland happened last summer, when a 110-square-mile chunk of the Petermann Glacier broke away. Other glaciers also shrank. And this ice loss is accelerating. “The main message is that the closer we get to a four-degree rise, the harder it will be to deal with the consequences,” says Dr. Mark New, a climate expert at Oxford University. Even if governments attending the current conference in Cancun agree to curb carbon emissions, global temperatures are set to rise another 3.5 degrees C over the next 25 years, says the International Energy Agency. To hold the line on 2 degrees C, renewables must account for 38% of total energy use by 2035, governments must end their subsidies on fossil fuels, and global demand for coal, oil, and gas must plateau before 2020. But with the Cancun confab certain to fail to re-invigorate even the grossly inadequate and largely ignored 1990 Kyoto Protocol, and the U.S. Congress and Canadian and British governments largely sold out to Big Oil bribes, replacing 15 trillion watts of worldwide energy production with energy conservation and non-polluting renewables over the next few decades seems farcical. Fuelled by the hot air of climate change deniers, Global Warming is already happening faster than anyone predicted as intensifying winds over Antarctica’s Southern Ocean disrupt the sea’s ability to store carbon. By mixing the waters, these stronger winds are bringing carbon up from the deep seas and raising the carbon concentration of the surface water – allowing more CO2 to dissolve into the atmosphere. After at least 12 years of intensive chemtrail air pollution, this failed experiment has only succeeded in masking the actual extent and rapidity of worldwide warming. If jet vapour trails are driving down air temperatures by more than one degree, even more reflective chemtrails must be having an even stronger effect. Could widespread contrails from more than 65 million annual high-altitude airline and military flights – and persistent chemtrails spread nearly continuously in the same stratosphere – be blanking out the sun? Worldwide air pollution confirmed this when Dr. Gerald Stanhill of the Agricultural Research Organisation discovered a staggering 22% drop in the sunlight in Israel compared with the 1950s. “Global Dimming” was happening everywhere. Between the 1950s and the early 1990s the level of solar energy reaching the earth’s surface dropped 9% in Antarctica, 10% in the USA, by almost 30% in Russia, and by 16% in parts of the British Isles. “This pollutant layer, which was three-kilometres thick, cut down the sunlight reaching the ocean by more than 10%,” explained world-leading climate scientist, Veerabhadran Ramanathan. But computer models consistently showed dimming from human pollution at just 1/10 this level. Airborne research showed that while pollution (including chemtrails) is indeed blocking some incoming sunlight, far more significant is what they are doing to the clouds. It turns out that tiny particles of industrial ash, soot and sulphur dioxide – as well as aluminum oxide, barium and other chemtrails constituents – have been turning them into giant mirrors! Because billions of human-made particles are providing ten-times as many nuclei around which water droplets form, polluted clouds contain many more water droplets – each one far smaller than it would be naturally. Many small droplets reflect more light than fewer big ones. So polluted clouds are reflecting much more light back into space than contrails and chemtrails alone – causing Global Dimming and preventing more of the sun’s heat from getting through. “Basically the Global Dimming we saw in the North Indian Ocean, it was contributed on the one hand by the particles themselves shielding the ocean from the sunlight, on the other hand making the clouds brighter. So this insidious soup, consisting of soot, sulphates, nitrates, ash and what have you, was having a double whammy on the Global Dimming,” Prof. Ramanathan remarked. The “what have you” helping to dim the sun beneath a characteristic murky haze includes millions of tons per year of 10-micron chemtrail particles being spread over much of the northern hemisphere. Dr. David Travis worries that cleaner air could mean even faster warming. Are chemtrails shoving us toward a dead end? While the greenhouse effect has been warming the planet, contrails, chemtrails and other air pollutants have been cooling it down. So the warming caused by carbon dioxide has been hidden from us by the cooling from air pollution – especially highly reflectant chemtrails. Reduce air pollution from chemtrails and carbon burning and the world could get considerably hotter. “We lived in a Global Warming plus a Global Dimming world, and now we are taking out Global Dimming. So we end up with the Global Warming world, which will be much worse than we thought it will be, much hotter,” warns climatologist Dr. Beate Liepert. Climatologists like Dr. Peter Cox of Britain’s Hadley Centre, Met Office “have begun to worry that Global Dimming has led them to underestimate the true power of Global Warming. They fear that the Earth could be far more vulnerable to greenhouse gases than they had previously thought,” broadcast the BBC. “We’re gonna be in a situation unless we act where the cooling pollutant is dropping off while the warming pollutant is going up, CO2 will be going up and particles will be dropping off and that means we’ll get an accelerated warming. We’ll get a double whammy, we’ll get, we’ll get reducing cooling and increased heating at the same time,” Cox splutters. With most of the world’s population situated on or near coastlines, a one-meter sea level rise is considered catastrophic. As world temperatures spike, no amount of carbon emission abatement will prevent a complete meltdown of ice caps – with ultimate sea level rise measured in hundreds of feet. Tropical rainforests will wither and catch fire, releasing more megatons of carbon dioxide into an overstressed atmosphere, driving Global Warming still further and melting even more methane from the permafrost and ocean seafloor. If ten-thousand billion tons of methane burp into the atmosphere, the world will become at least 10 degrees hotter. Earth will experience temperatures unknown over the last four billion years. But more chemtrails are not the answer. That winter, the protective ozone layer over the Arctic thinned to the lowest levels since records. At high altitudes, 50% of the protective layer was destroyed. Because their engines deposit vast amounts of ozone-destroying nitrogen oxides directly into the stratospheric ozone layer, non-stop jet traffic – including chemtrail spray tankers – are largely to blame. For every 1% thinning of the ozone layer there is a 2% to 3% rise in skin cancer. Currently, more than one person is dying from melanoma every hour. And Professor Alan Robock insists that further tampering with Earth’s interlocking atmospheric processes could create famines and droughts, threatening the lives of no less than one in every three persons on Earth. Robock should know. He worked on the Global Dimming dilemma with Prof. Farquhar. Now this Rutgers University professor declares that geoengineering experiments (a.k.a. 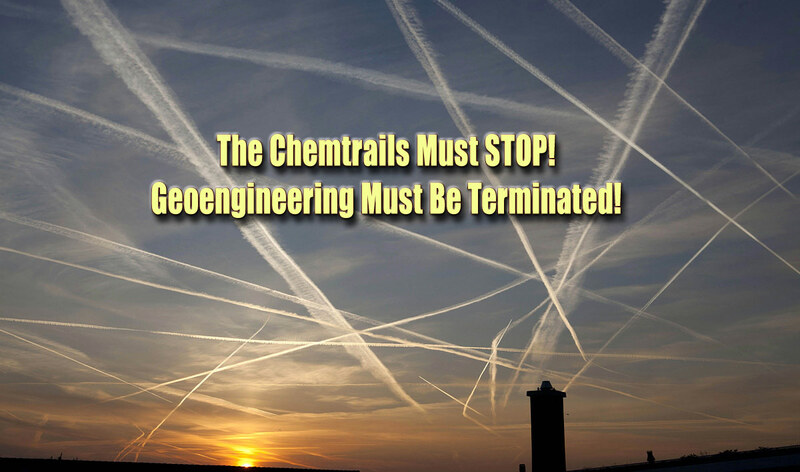 stepped-up chemtrails) “could create disasters, damaging the ozone layer and potentially altering the stratosphere by eliminating weather patterns such as the annual Asian monsoon rain season, which two-billion people rely upon to water their crops and feed the population. In this Last Chance Century, the time to stop chemtrails and other geoengineering – and curtail carbon emissions – is now.